Fantastic idea - though I would've put the tag line on the outside where more people will see it. 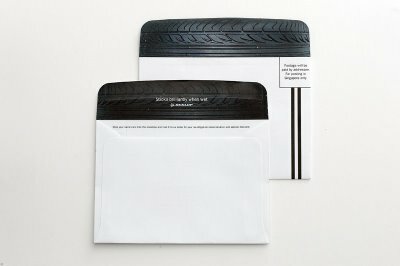 The idea is for the tyre, not for the envelope ! Yeah - but once you seal the envelope the message is hidden. Opening the envelope destroys the message. And with the message on the inside, only one person ever sees it. HOWEVER, on the outside the message is seen by everyone who handles the letter, and -when opening- is associated with the difficulty of pulling the tire away from the road. So, the tag should be on the outside. Unless you truly enjoy pointless advertising that is only seen by the same person day in and day out. In which case, you're the creative director of a prima donna ad agency.